Today my VERY first music payout came in. The direct deposit showed up in my bank account. It's fantastic. Today is just a momentous day for me! I feel like things are JUST getting started. I can hardly believe my eyes, but there it is... 35 bucks. It means soooooo much to me. Because it makes it real. It makes it an actual business venture. A creative business. There's just something legitimate about actually making money from my creative things. Hopefully I can keep making money from my music and keep getting payouts and just have the sales directly deposited each week. Then from there I can use that money to buy more music related supplies and equipment and software etc. I can also use the money to do more with youtube and writing books and just more media related things to then put out there. The more I have coming in to fund things... the more I can make and put out to the world! I'm living the dream. It's very surreal though. The idea of making money off of something creative. It's just amazing. I love that it's actually happening! It's funny how you dream of something for so long... and it's always something you tell people that one day it will happen... and then when that day finally comes... it's sorta like you just want to pinch yourself. Ha... yep and say to yourself " WOW this is just... SOOOOOOOO COOOOOOL!" Anyways... I'm a pretty happy little clam at the moment... or since I'm not a clam... I'm has happy as a clam. So here's to the start of lots of big things. Lots of music, lots of media, lots of videos, lots of books and lots of collaborating with lots of fantastic people. I'm on my way! This is seriously delayed, buuuuuuuuuut I never posted a Thanksgiving post! Soooooo tonight here's my little Thanksgiving post... delayed. I'm just so very thankful for EVERYTHING in my life. It's just... good right now. Everything is good and I'm so lucky to have all that I do and know all the people I know and I feel like every day is a gift to me. So yes... very thankful sooooo very thankful. I have so much and owe so many thanks to so many people. I also love this time of year. I love the chilly crisp air... I love just staying in cozy with the heat on all bundled up. I just really enjoy it. Lastly... this time of year has my most favorite thing of all... pumpkin pie... it's my favorite. So I'm very thankful for everything... but I'm especially thankful that pumpkin pie is a thing. Seriously... you have no idea... I LOVE pumpkin pie. I mean I would eat that EVERY single night if I could! I'm pretty sure eating pumpkin pie every single night of the year wouldn't be that healthy. But I love it that much, I totally could. Especially with whipped cream on top. Soooooooooooo goooooooooooood! Tonight was my mom's 40th high school reunion. I was asked to DJ. I packed up all my equipment and made a playlist and got to the place about 5pm tonight. It was pretty much the same format as a wedding... sorta... cocktails and drinks and such then dinner then dancing it up! The thing went from about 6 to 10. It was a pretty great time. I got free food and I played requests for people. It was awesome because pretty much ALL of the requests I didn't actually have... but I could just connect to the wifi of the country club it was at and download nearly any song. SO they were all like "Do you have..." And I was like "Stop right there... I have it all yo!" And they were like... "YOU THE MAN!" And I was like.. "well thank you very much that's so kind of you!" His secret service peoples where all like... secret... and what not... but I'm pretty sure at one point I did notice one of them tapping a toe. He's one of the owners of the 76ers... if you look up that list of owners of the 76er's one of them is Will Smith. That means that guy that I was in the same room with... has also been in the same room as Will Smith. Soooo technically I'm two or maybe it's one degree(s) away from meeting Will Smith. But in all honesty.... everyone there tonight was pretty awesome. And you wouldn't have known just by hanging out there tonight that the few people that were up in the high roller status and hob nob with rich and famous people were anything but just people. I mean aside from the 3 guys in suits in the corners of the rooms that is. But other than that... they are all just people! Awesome people too. Oh and my mom had a fantastic time. She and her one friend organized most of it. It's a lot of work to organized a reunion. All I did was just stand there and eat a bunch of food and play some tunes. Which was a pretty awesome time if I do say so myself. No... it's not a cat telling you to get out. Think... Whiteout... but instead it's not Whiteout... it's Cat-out! It's when you want to post a picture of yourself online but your friends are also in the picture. But you KNOW your friends don't want to have their faces in the photo... soooo you use Cat-out. It's simple just Google image search a picture of a cat making a funny face... such as the photo above. You may also use your own picture of your own cat. Then crop the photo so that the cat is just showing it's head/face/possibly front paws if it adds to the cuteness/catness factor. Then take the photo of you and your friends and place the cropped cat on top of their faces. DONE! You've officially Cat-outed your friends. Now you can go ahead and post that fantastic picture of yourself online and your friends can remain anonymous all thanks to Cat-out! I know, it's awesome right? Yes. Note: Please Cat-out responsibly. This also works with dogs, hamsters and various other pets. Feel free to get creative! One of my friends from college posted this on her Facebook timeline today... I thought it was super cute/cool/made me smile sooooooooo I figured I would randomly repost it here on my blog! 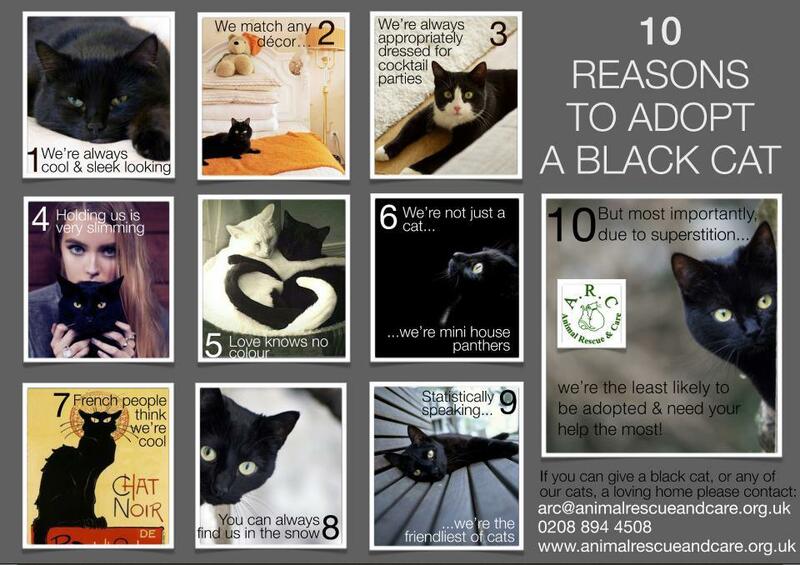 It's a picture of 10 awesome reasons why to adopt a black cat. I'm pretty excited. I placed an order for a 5 pack of some professional sound proofing material that I've been wanting to try out. The stuff is basically little self contained blankets that can be hung on the wall. I'm going to hang them around my little recording space and make it even more sound proofed. Right now I just have some basic materials that I got at Guitar Center. It really doesn't help much though. They JUST changed the color available to black and red so I'm tempted to order a second 5 pack... the black and red looks SOOOOO awesome. When I went to order they only had black and gray on the site. They change the colors fairly often. I've been waiting for a good color combo to come up on the site to order. The second thing I'm excited about is this little program called Synkron. It's a free open source program. All it really does is sync two folders. It's great though. I use it at work to backup my entire profile on my work PC to an external hard drive. I run it about once a week. That way if my machine at work takes a dump I can get back up and running pretty quickly and not lose any data. I also use it to sync my external archive drives on my mac. So what I do is anything I move off my main hard drive to free up more space, I put on an external hard drive. I have a second hard drive that is exactly the same as the first one. Then using Synkron I sync archive 1 to archive 2. That way if one of the drives ever failed... I can just replace that drive with another one and use Synkron to rebuild the failed drive from the good one. I also keep a third... just in case of two simultaneous failures. I'm a fan of keeping things in triplicate. When it comes to important personal data... you can never have enough copies of it! That stuff is irreplaceable. That's my B data... my main data? I won't talk about how many exact copies and places I have that stored. It's ridiculously excessive. But it helps me sleep at night. Anywho... previously I was using an old buggy program on my mac that was no longer supported and really didn't work that well and would crash some times... etc. etc. But I found out they also make a version of Synkron for not just mac, but linux as well! This made my day. I immediately downloaded it and then created a small word doc on drive 1 to test it out. I then ran the program on drive 1 to drive 2 and it synced up! Sooooo I've uninstalled the other program and I'm now using Synkron not just at work but on my mac as well. There is also a portableapps version of the app on www.portableapps.com so make sure to check it out. Soooooo... this morning when I woke up... I had apparently been sleping on my arm. You know when you wake up and your arm or leg or something has no feeling because you were sleeping on it and your brain decided to wait to wake you up until it was good and asleep? Well that happened to me this morning. Or... well, since I slept in until about noon ish.... it wasn't so much morning. Anywho so I got up and usually the first thing I do is brush my teeth... but I ALWAYS use the same hand to brush my teeth... this was unfortunately the one that was still partially asleep. I tried brushing my teeth with the other hand but my coordination just isn't as good... so I kept switching back and forth to the other arm/hand as it was waking up and getting its pins and needles feeling back. It's an odd sensation to control an arm that had been without feeling... the thing was all over the place... I kinda sorta got tooth paste all over my face and nose and what not. But eventually the feeling and coordination came back and all was well. I was able to finish up brushing my teeth and wash my face off... and my teeth were all clean again! Just got done laying down and experimenting with some electric guitar tracks on a fun little pop song I'm working on at the moment. It's a catchy little nerdy song about pets. Yep. It's about pets. Ha... It's super nerd pop. It's also very "innocent". I think I'm probably going to make a video for it and really make the video and the song one thing. I feel like the song needs a visual aspect to it for full effect. Anywho... it's just so weird because the song just puts a smile on my face every time I work on it... I kinda can't wait for people to hear it. It's just such a fun track to work on! I'm really enjoying it. So I've been doing some self reflection and thinkings... I definitely realized... my outlook and attitude needs some adjusting. Soooooo I've decided to adjust that. I've got lots of good things that I'm working on... sooooo many works in progress.... songs, videos, artwork covers for my next single to upload, and of course two novels... it's a crazy process dealing with it all. But it's also lots of awesome things to look forward to! The thing is... I feel like a vessel or conduit for creative energy. It just kinda comes through and out of me and I can't get it all down fast enough! I think that kinda frustrates me. I feel bogged down sometimes by all the other "life" things I have to do. I feel like I could really do so much more... but I think part of my bogged down issues... also are just an outlook thing. Soooooooo if I make my attitude more positive about things... I won't waste time and can be more effective! Also... worry ing about things and stuffs and what nots... definitely makes me less productive with creative things because I'm all worried about if I can fix things in my life... or I worry about that whole finding love thing. I think it's better if I just kinda don't worry as much about any of that stuff... and just be all positively positive about how things are as is. "As is" is probably the keyword. Just taking things as they are and as they come. That way I can sorta do more with what I have and then in turn make more things happen. This post is kinda rambly and unspecific. Buuuuuuuut... I don't know... I feel like I need to be more appreciative of how things are. So I'm gonna be more into things and people and places "As is". So that includes not just when things are going well and good... but when they are not going so well also. Because as annoyed as I was that I had lost power.... I eventually got it back. Storms don't last forever. They eventually wind down. Sooooo there's no sense in me getting all worked up over it. That doesn't help much anyways. Sooooo I haven't had power now since Monday evening. It's Saturday... hopefully it comes back soon! I'm just ready to get back to recording and all that. I can't record music without power. Soooo hopefully once it comes back and I can get back to work. I have lots of things to get done and put up and record and write and all that good stuff. At the moment I'm just hanging out at coffee shops using their wifi and power and such. One thing is for sure I will appreciate power soooooooooo much more once I have it back! That's all I gots for now. I hope everyone else is warm and has power and is enjoying their Saturday.